If you represent an online service (website or app) that allows businesses to have a presence where they can promote their business we can help you get more customers and improve the value they get from your service. We support more than 1500 online services .. yours may be one of them! Control and update your profile page. Access and update your customers data that is incorrect or incomplete. Let businesses know more about your service. myPresences's goal is to help small businesses get the most from their online presence with a minimum of time and knowledge. To achieve this we would like to be able to provide insight into how their businesses are represented on a maximum number of services online and provide them with the ability to extract as much value as possible from each of these services. We also educate business owners on the best opportunities for them online and why they should have a presence on your service. We are a service to business owners only and only provide access to their own information or information that is directly relevant to them, as such, we do not compete with your service. Our service is extremely beneficial to Online Services as we help you to have better and more accurate business data and help your businesses to create more engaging presences that will attract more consumers to you. If you would like to add your service to myPresences first check to see if it already exists in the Service Explorer and if not contact us at the address below. We are very interested in supporting all active services even in smaller niche business categories. Each Service has access to a special account that allows you to see information on how your service is being used by members of myPresences. This information is also available via our Service Providers API. (API Keys are available when you logon to your account). All the businesses on myPresences with a presence on your service. And all the ones that don't. Plus a list of data inconsistencies. Control your information in myPresences. Add Claims and Resources to help your users engage better with your service. 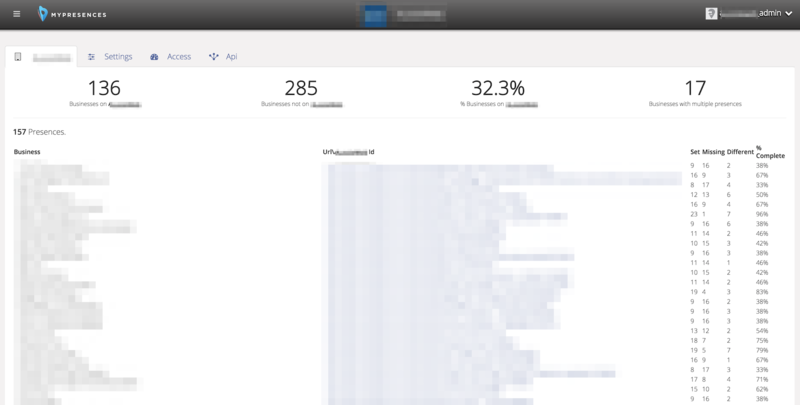 Usage Analytics How myPresences users use your service. How many have a profile? How many should have a profile but don't. Business Data Analytics How accurate and complete is the business data on your service for myPresences users. Service Comparison Analytics How does your service compare to other services for myPresences users. Correct business data for your Businesses Access up to date business data for all businesses on your service that are users of myPresences.